KitMonsters – Field Music. The music makers’ guide to making music. 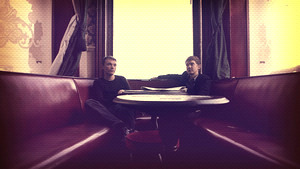 Field Music are musical magpies who dazzle with their playful and eclectic approach to music, yet distil it into crafted and memorable guitar-pop. 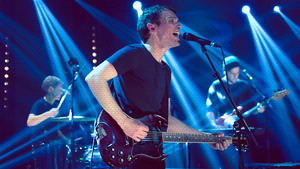 They swap vocals, instruments, and songwriting, and produce their own tracks from their Sunderland studio. They’ve been nominated for the Barclaycard Mercury Prize for their fourth album Plumb, and the nomination has thrilled fans and fellow musicians alike. There’s now a special Mercury edition of the album with extra live tracks. We talked to Peter and David Brewis, who are the core of Field Music, along with Kevin Dosdale and Andrew Lowther who plays with them live. They told us about crafting the album, their much-loved kit and their guilty pleasures, plus their take on ‘the loudness wars’. David and Peter found a new way of working when they were recording Plumb, and the result was a sparkling, exciting and acclaimed album. 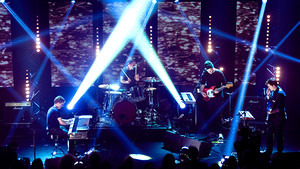 One of the principal ideas for the new album was to let the material dictate the kind of form and the structure of the music rather than trying to stretch bits of music into what would be conventional song forms. We decided that we didn’t really need to do that, that we have our own studio and the label let us get away with murder really. Which was kind of in opposition to the last album that we made. The last album, Measure, was a double album, much longer songs, you know, basically normal-length songs. This time we decided we didn’t really need to do that, and that’s why it’s more concise. And more segueways. Being on the Mercury shortlist shows the decision was a good one, and they are delighted to have been nominated. It’s one of the few kind of musical events which tries to reward the creative outcomes rather than the commercial outcomes. Although I’m sure that’s a very difficult thing to do in a pure way. It’s nice to be recognized in the context of this event, which rewards the creative endeavour rather than the commercial impact of something. And to be honest, the chances of us ever being awarded for the commercial impact of anything is negligible. There’s a panel of judges and people who care deeply about music, and it’s lovely to think that they’ve listened to all of these albums across the year and they’ve thought that our album deserved to be on this quite exclusive list. And hopefully what it means for us is that a few more people will hear the record. 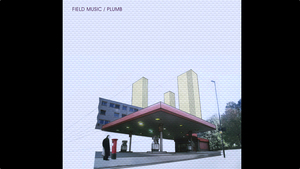 Plumb was recorded in Field Music’s new studio and it required some sonic exploration. We were finding our feet in terms of sound and what sort of things we could do with the space. If anything, that’s something that we’ve done since day one, recording things. We don’t try and tame the space, you know, we try and use the sound of the space that we’re in, so we had to get used to and find out about the rooms that we had, and how the instruments were going to sound in them and how we could use the microphones to capture the instrument in the space. Having their own space even made a big difference to what instruments went into the album. We had the added bonus this time round of not sharing the studio space. When I say studio, it was just a room that we rented in, not a community centre but similar to that. We’d been there for ten years and we shared it with our friends in The Futureheads. But it always meant having to compromise with how you use the space because they have it as a practice room and we were using it primarily as a studio. In the new space, it’s ours all the time and therefore if we want to leave every single keyboard that we own set up ready to record at all times, we can. And that did mean that we probably played around with keyboard sounds a little bit more on this record than we had in the past. The album before that, Measure, was probably as close as we’ve got to making like a guitar rock album. And this time round we let the keyboards fly. To be honest I struggle to write anything if I’m not on my own in quiet places. And it tends to be either, you know, a little snippet of lyrics come to mind, or if I’m sitting playing… I mean for me it’s generally the guitar. A snippet of music which just captures your imagination, just for that moment. And then you have to find what the song is which goes with this snippet. Again I suppose that ties in with how we made the album, in that we found we had lots of little snippets which just really wanted to remain snippets and we allowed that to happen. Yeah, for me it involves a lot of thinking time. A lot of time to kind of let something percolate in mind. Peter agrees, though he prefers to begin songs on the piano. I think the initial sort of inspiration if you want to call it that, for writing songs or music is generally a small musical or lyrical, like little problem, and trying to find a little solution to it. And then after that you have to try and somehow capture that physical moment, that feeling you got when you first came up with this thing. Because that’s the Eureka moment in a small way. So how do they work out who does what when they share roles and even instruments? The reason why we end up sharing roles within either the band or in the studio, is generally because when we write, it’s separate, and then we come into the studio and the other person has to be the problem-solver and the person to do all of the other jobs that the other person can’t, or can’t do at the same time as doing the other jobs. So we have to just be flexible with our roles in Field Music. And the same when we do the band live, we have Kev and Andrew, and they have lots of jobs to do, it’s not just like Andrew’s the bass player and Kev’s the guitar player, it’s more complicated than that. So we have to just, in the studio and live, figure out a way of complementing the song, or the music, as opposed to, right, I’m the drummer or I’m the singer in the band so that is my role in the band. We’re not like that, we can’t be like that. They put a lot of effort into their lyric writing as well, and regard lyrics as equally important as the music. In terms of lyrics we’ve got better at being able to express our ideas through lyrics as well as just music. I mean, we probably come up with more musical ideas than we do lyrical. I think we realised we need to put as much work into lyrics as we do into the music, you know, that which is a big editorial process. I’ll try and write as much nonsense down as I can, as many ideas down as I can and then it needs to be edited into something coherent. In terms of how they come across on the record we generally try and make everything sound quite clear. I suppose we spend quite a long time making the records, so it’s a little bit meticulous, and you know, we’ve got Northern accents, so we really need to enunciate, otherwise people might not have a clue what we were talking about! Field Music have strong views on the ‘loudness wars’ when it comes to recording, and are doing things their way to make what they see as the most of current technology. Less is more, says David. Both me and Peter had been getting a little bit frustrated at the obsession towards louder and louder records at the expense of dynamics and clarity. We read a book called Perfecting Sound Forever and it made us more determined not to succumb to the loudness wars - it seems absurd that CDs are capable of such amazing dynamic range and lack of noise and all we do as recordists is try to squash as much volume as possible in. We’re probably the only band around whose records have gotten progressively quieter! Their influences and inspirations are a surprising mix, from Roxy Music to John Bonham, and not that much Indie according to David. I mean the only thing I could say clearly about my record collection is there’s not an awful lot of what you would term Indie music in it. But you know, everything from 30s blues or 40s big band jazz or weird, avant-garde 20th century classical music, through girl groups and Motown and Stax and the Beatles. Peter’s take is more rock, via a bit of hip-hop. Yes that’s right! I don’t really listen to that much contemporary indie or guitar music any more really. I don’t. Maybe it’s because I’m so close to it I kind of feel like I’m involved in it. I kind of don’t want to hear what else is out there. However, all of our influences, musical or otherwise, are essentially filtered through the lens of rock. Because that’s what we initially started doing, you know, so those are the skills that we’ve got. We might think, oh we’ll play a drumbeat and it’ll sound like Timbaland, but really it has more John Bonham in there than it will ever have sort of Timbaland. And probably the same with guitar. You know I’m going to nick one of those Stravinsky riffs and I’m going to turn it round and I’m going to do something different to it, but it really just sounds like Jimmy Page or Clapton or something like that. It’s putting things in a big melting pot that’s important, adds David. Probably a lot of the pop and rock music that we do love most is pop and rock music which is really voracious. You know, the Beatles didn’t listen to other beat groups, they were taking stuff from music hall, Motown, and all things and places, the same with something like Roxy Music or David Bowie. They were just like sucking in influences from all over the place, it didn’t matter where it was. The fact that it was them, and their performances, and their songs sticks it in a genre, not what they were being influenced by. Though both the brothers play and collect guitars, it was David who started off and bought his first guitar shortly after Peter got his first drumkit. Peter had his drumkit and I must have felt left out, so it’s another really silly story. We went on holiday with our parents in 1990, to Yugoslavia and I’d saved up loads and loads of money. Well, it was probably about £30 and it was like, I’m going to use that, I’m going to buy loads of things, it’s going to be great. And then the currency was devalued while we were there, so I came home with probably more money than I’d left with, and bought a £21 Encore acoustic guitar from Argos thinking, oh, I’m going to play music as well, it’s not just Peter, and then, being a little ten-year-old weakling, Peter learned to play that guitar much faster than I did. Rather than becoming rivals, the siblings grew closer through a shared love of music. At first, playing was more important to them than listening, as David explains. We just became obsessed. Just with playing, more than music actually, then. I don’t feel like I really discovered how much I loved listening to music until I was 16 or 17. But we started playing very early. I loved Led Zeppelin and I loved the Black Crowes aged 13. And that was what we wanted to do, but we were just playing at it. It wasn’t until a little bit further down the line and we stopped playing, probably because I was sick of going into school the next day after playing a pub gig, and I couldn’t give up school so I had to give up pub gigs. And started to discover music. They collected plenty of guitars along the way. We had a bunch of horrible ugly guitars after that, and then, once we started to kind of pay attention, and we had all this money from these pub gigs that we’d been saving up, we started to just get bits and pieces that we liked more, so we had a Strat, a kind of 60s reissue Strat. David gave the Fender Stratocaster a new paint job, though he admits it wasn’t entirely successful. I did a terrible paint job on my Strat. Kind of ruined it but it’s still playable, which is the main thing. I think I wanted it to look like Richard Thompson’s Strat. That pale blue Strat that he had, and it just looks like somebody’s gone at it with a can of car paint, which is actually what happened. Their key guitar is a Gibson SG. And I found this mutated SG Special. It’s in the style of a 68 SG Special with P-90s, but whether it really is one we can’t tell, because it’s a mess and it’s been done over several times I think. But it’s still the guitar that I use most often, and I absolutely love it. Actually when we’ve looked for things that might work as a replacement we’re going to really struggle because it is such an oddity. They find the SG really cuts through the mix. The SG, especially with these P-90s, has this real sharpness without getting twangy. And because for recording we mostly use this 65 reissue Fender Deluxe Reverb, which is this absolutely fantastic, brilliant low-powered amp, I think sometimes, in combination with twangy Fender guitars, it’s like Fender overload! And the SG, it kind of mitigates that slightly, but has that bite that you don’t get from Humbuckers. It doesn’t sound too like the Strat, which can sometimes, depending on the song, sound quite spindly. Peter and David don’t like to use too many pedals and rely heavily on their Fender amp for their tone. The Deluxe Reverb doesn’t have a master volume so essentially the sound comes from choosing which guitar and then deciding how loud it’s going to be, so at three it’s bright and clear, at eight you have to make sure you’re in a different room, but it has a really nice drive to it. And we tend not to record with effects. Even on stage it’s pretty minimal, really. We might put a bit of automatic double tracking on afterwards, depending on whether we want it to kind of shimmer a bit. And actually when we’re mixing we tend to use quite a lot of really quick slapback echo as well. That’s not just on the guitars but we do tend to stick a little bit on guitars. Peter’s recently had a bad case of tremelo envy and bought an Italia guitar as a result. We toured with a band, earlier this year called Stealing Sheep and their guitarist, Emily, was really fantastic. She played a Strat, and she used the tremolo to great effect, and I felt incredibly jealous, that essentially I can’t use a tremolo, I don’t have a guitar where we use the tremolo very much. I wanted a guitar which had Humbuckers on, because occasionally we’re going to need those sounds and I wanted a guitar with a tremolo arm. So that I could figure out how to use it, find ways to use it. And we did some extra recordings for a compilation of covers that we’ve done, and the guitar’s been really really useful for that. It’s got some quite odd pickup combinations, what do they call them? Coil-tapped? They confessed to a very guilty pleasure, that they’re not quite ready to taken on stage. It’s a pretty wild axe - a double-headed Danelectro! I’d very much like our keyboard collection to be bigger. They have an upright piano, which they feel has improved their piano sounds. We’ve got a really nice-sounding upright piano, Challen, which I bought from eBay, someone in Durham was selling it. I think they use them in BBC studios. I read that and I thought, well, it must be all right. And it has improved the piano sounds immeasurably. Because our old piano wouldn’t really go in tune. Challen was a historic British make, with pianos known for their warm tones that are still sought after. 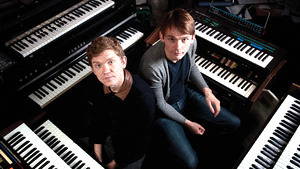 Field Music also have a Yamaha CP70 electric grand that they use frequently. Peter says it’s particularly good for recording. It’s really useful to play that while we’re recording drums at the same time. So we can basically sit in the same room and I can play piano and Dave can play drums. And we can essentially play together because it doesn’t really make that much sound. The other keyboard that we probably use the most is the Yamaha DX21, an old FM synth, which despite being an absolute nightmare to program and being slightly broken, still turns up some great sounds every now and again, and we do use that on stage as well and Andrew plays that on stage. We’ve got a bunch of other little funny things, we’ve got a Hohner Pianet which we’ve gradually repaired and made usable because they’re also pretty odd. We’ve got a Vox Continental synth out the back in the studio, it keeps breaking and being fixed. We’ve got a Juno-60 without any memory, the battery’s gone on it so it can’t store any sounds. You’ll have to watch the video interview to hear their Juno-60 impression! The instinctive and organic approach to drumming that Field Music display has been referred to by some as ‘Octogroove’. Peter is known for being the original drummer in The Futureheads and David explains how the nickname came about, from fellow musician Neil Bassett of Hyde & Beast. 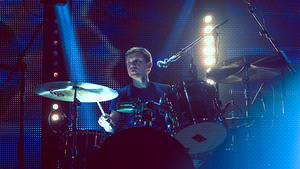 Neil Bassett is particularly referring to the drums that were on Peter’s record under the name The Week That Was. When we went out to play it live, somehow I ended up getting the role of drummer. I had to put in a lot of work because actually, uniquely amongst the records, the two solo albums have more programmed drums. They also have some quite complex percussion parts. We were touring that album as a four piece, and I had to figure out how to play it. My drumming was rudimentary at best, but I think by approaching it as parts to play rather than drum beats, and by practising loads and loads, eventually I managed to come up with things that approximated the drums that either Peter had done or Peter had programmed on the record. And in terms of what that’s let us do after it, it just means that we’re both half-decent drummers rather than just Peter. The first musical equipment the brothers acquired was a small Premier Club drum kit, which Peter hoped to impress girls with. Peter decided he was going to learn to play the drums and, you know, me, aged eight or nine, being an expert on drums, I went with my dad to this barn to say, yeah that drum kit looks great. But actually the next year we got the drum kit we’re still using now, which is a Pearl DX Professional. I’ve never seen another one, I don’t know where it came from. The drum kit has stood up to the test of time, as Peter explains. It’s like a pre-Pearl Export kit I think, and it must be well-made because we hit them reasonably hard and we’ve had it for 17 years, even 20 years, oh God. They are hugely attached to all of their kit, it almost has special powers of its own. There’s a load of flukes in the kind of gear we use. For instance, we’re both really, really picky about using Paiste 13” 2002 hi hats. And the reason is that the very first kit, that Pearl kit just came with a pair, and we liked them. And we got to the point where we were recording, probably even by the first album, and we hadn’t done much touring. And we thought, there’s a crack in these cymbals, if these cymbals break we can’t make music any more! Like, this is our sound! Because we don’t know what we’re doing with them. It’s the same with our snare drum, you know, actually the snare drum is from the first Premier kit. They admit to worrying sometimes that they won’t be able to go on without their favourite instruments, like their snare. Essentially, when that started to break we just thought, that’s it. We won’t be able to do it. It’s on the first two songs we recorded for the first album and then it started to fall to bits, and we just thought, oh no, that, the secret all along was the sound of the snare drum. Like, we’re useless, what are we going to do? They still have that snare, as well as a newer Gretsch one. 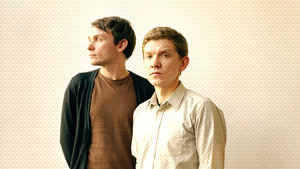 Field Music rarely use programmed drums, though they do play to click tracks from time to time. Their unusual time signatures are organic rather than carefully calculated. Most of the rhythmic stuff on the record comes from what we feel the momentum of the melody is, or the kind of momentum which is going to work best with the tunes, and sometimes that’s like a complementary momentum. And often we’ll decide we need something which plays against the melody or plays against the tunes. We’ve been doing that and exploring that really since the very first record or even slightly before that. We never ever think in terms of time signatures or anything like that. I’ve been told one of them’s in 7/8. We tend to find out if we have to write string arrangements for the song and then - yeah OK we’ve done an odd time signature here, we’re going to have to figure out how to present it to real musicians.